While most campers and paddlers are impatient to get out and paddle Algonquin’s Lakes this Spring, I still have winter on my mind. I think it’s because winter decided to ignore my part of Ontario this season. I’m pretty sure that I could hear my snowshoes quietly weeping in the basement most weekends. Happily, we had a very special trip to Algonquin Park that gave us a few days living in a yurt on Mew Lake, “real” winter weather and some seriously snowy playtime. It wasn’t just any regular trip to the park. 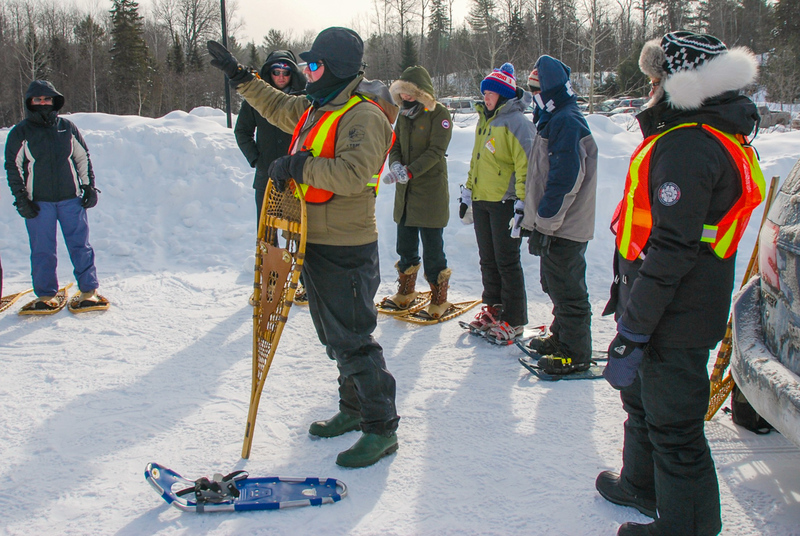 It was Family Day weekend when park staff and volunteers hold the annual Winter In The Wild Festival. Winter In The Wild lived up to its name, offering something for anyone who loves to get outside, go explore and do stuff. Bird watching, snowshoeing treks, expert talks in the Visitor’s Centre, winter camping demonstrations, skating on an outdoor ice rink and a wolf howl at Mew Lake Campground were all part of the fun. Mother Nature added the truly wild touch by throwing record-breaking low temperatures at us. 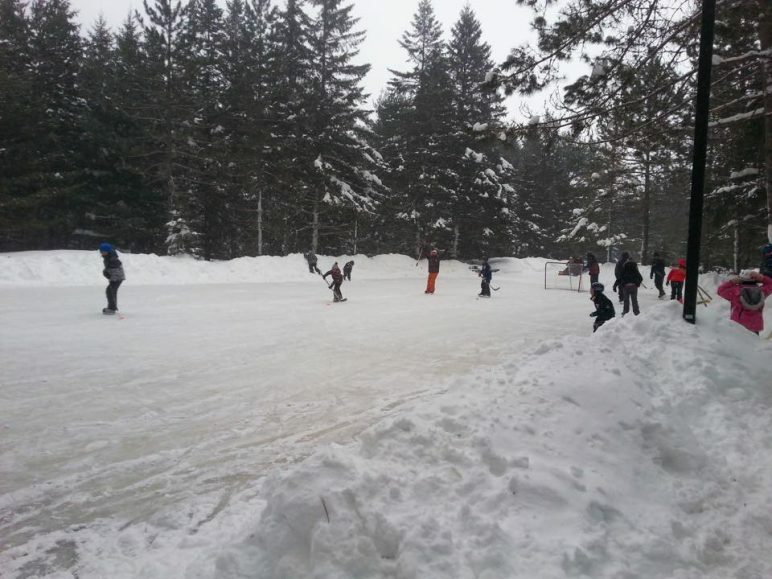 The overnight temperatures in the park reached -42 ℃! 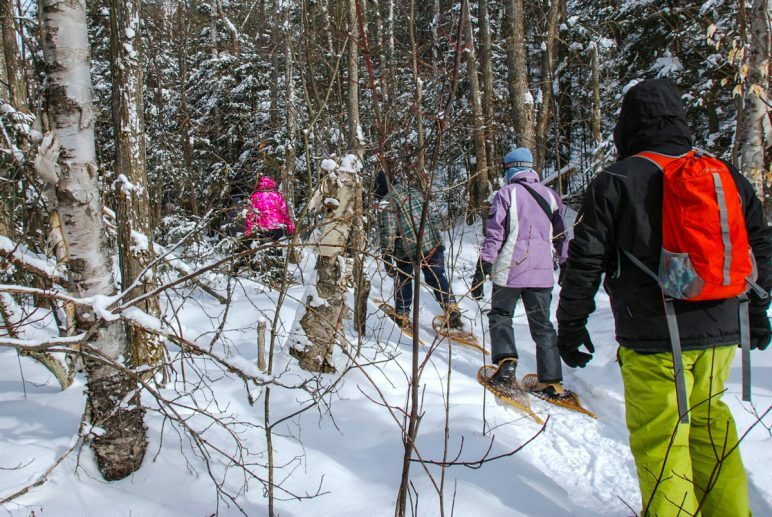 Despite frigid temperatures, we took a guided snowshoe trek, which took us off-trail and into the Algonquin forest. We don’t normally take organized hikes, so joining the park naturalists and a bunch of other snowshoers was a first for us. We really enjoyed it! The group was excited to be outside and I think we all bonded in our collective chill. And I mean chill in the truest sense of the word. It was cold out there. So cold, that the hike was shortened to about half the distance we would normally explore, to reduce the risk of exposure-related problems like frostbite and hypothermia. It was worth getting out in those temperatures, though. We learned some interesting facts about how wildlife survives the cold in Algonquin and saw some really neat signs of bear activity that happened in the warmer months. 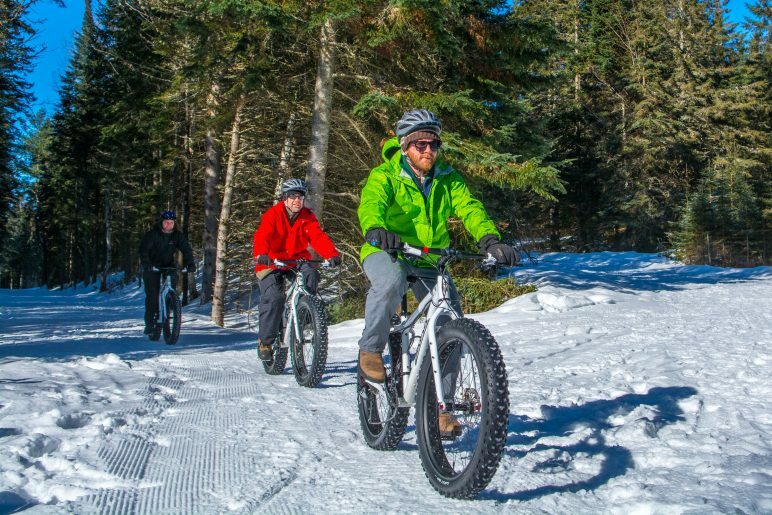 For trekkers who have never experienced snowshoeing, or using old school shoes it was a great way to try something new, but oh-so traditional. 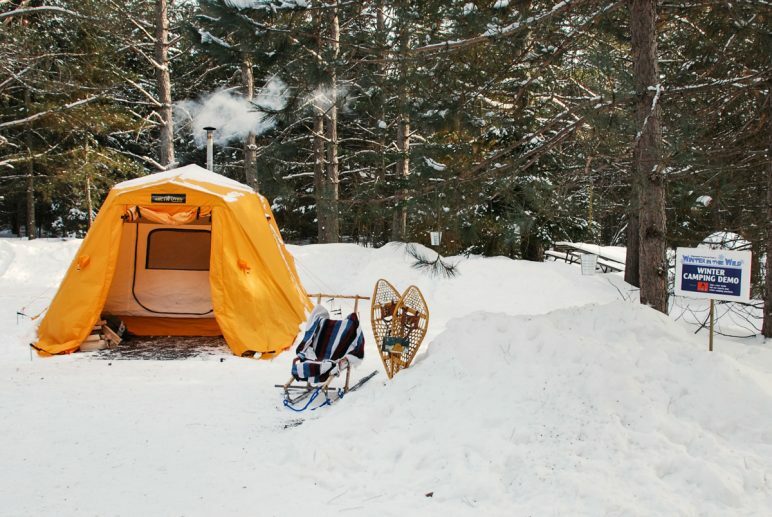 While camping in Algonquin is iconic during the summer, we learned that winter camping in the park is a lot more popular than you would expect. 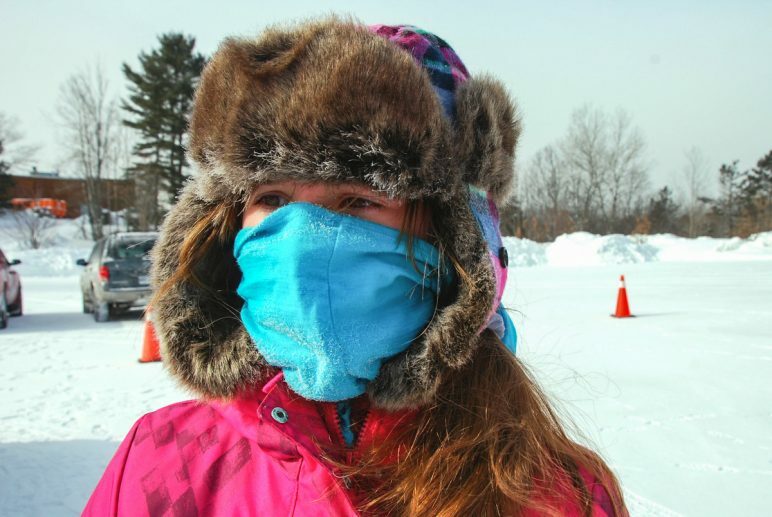 Mew Lake was fully booked the weekend of Winter in the Wild, with people camping in Yurts, trailers, cold tents and hot tents. The Festival was a great opportunity to check out a few different winter camping set-ups, with campers volunteering as hosts, welcoming visitors to their sites. As we wandered along the campground roads, stopping at outdoor bonfires and visiting the different campsites, we discovered that the hot tents were actually warmer than our park Yurt. I “might” have even mentioned to Alex that I would be willing to try hot tent camping. 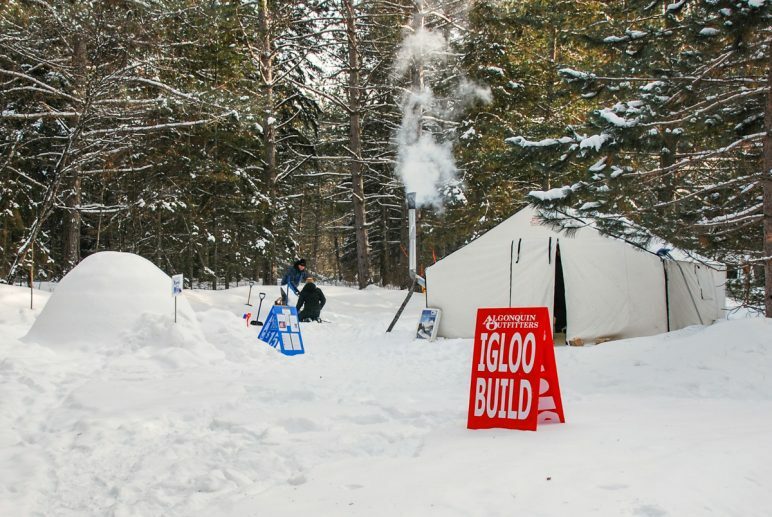 But after experiencing -42 at Mew, any ideas of cold tenting, or camping in an igloo like the one built by Algonquin Outfitters as a demonstration were quickly, coldly ruled out. It was fun to see the different set-ups in the campground, and really neat to see the modern way to build an igloo with a simple tool. I think at future festivals, it would be great to have experts giving presentations about specific topics that delve a deeper into winter camping, like Winter Camping 101 talks that cover things like how to stay warm in your sleeping bag, the best way to dress for frigid, outdoor activities and how to cook outside when the temperatures drop below 0℃. We closed out our time at the Winter In The Wild Festival with one of the most incredible, uniquely Algonquin experiences a person could ever encounter – a wolf howl. After a great introduction to wolves and wolf research in the park, a park naturalist led us out from a toasty hot-tent into the frigid night to see if we could communicate with wolves. It was so cold, the snow crunched as our group walked and there wasn’t a cloud in the inky, black sky. Our guides howled into the night and we waited, hoping to receive a howl back from one Algonquin’s elusive wolves. It wasn’t easy standing still and silent, when all we really wanted to do was wiggle and jump to keep the blood flowing to our toes. Did I mention the temperatures dropped to -42 ℃ that night? But the desire to hear a wolf far outweighed the discomfort of the cold. The guides howled a second time, and we were rewarded. The wolves howled back! It was nearly impossible to stay calm and quiet as one of my Algonquin Park bucket list items became a reality. In the warmth of a hot tent after the walk, we found out that this is the first time the wolves had ever answered during a Winter In The Wild wolf howl. I think the park naturalist was even more excited than we were. And all of us declared that it was worth every single negative degree and frozen toe to experience the wolves howling in the night. In fact, with the stars shining overhead and the snow crunching underfoot, I cannot think of any better way to wrap up a perfect Winter In The Wild day. 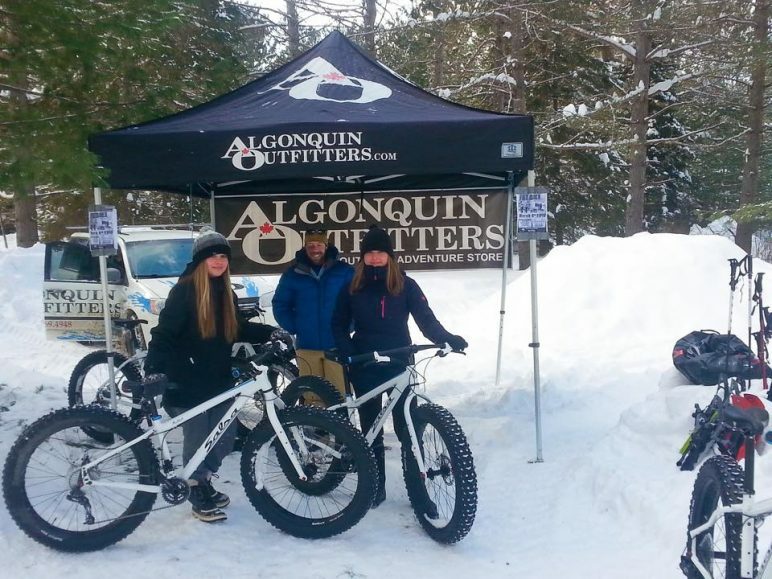 Ontario Parks and The Friends of Algonquin Park are proud to announce Winter in the Wild Festival happening in Algonquin Park on February 18, 2017 (Family Day Weekend). 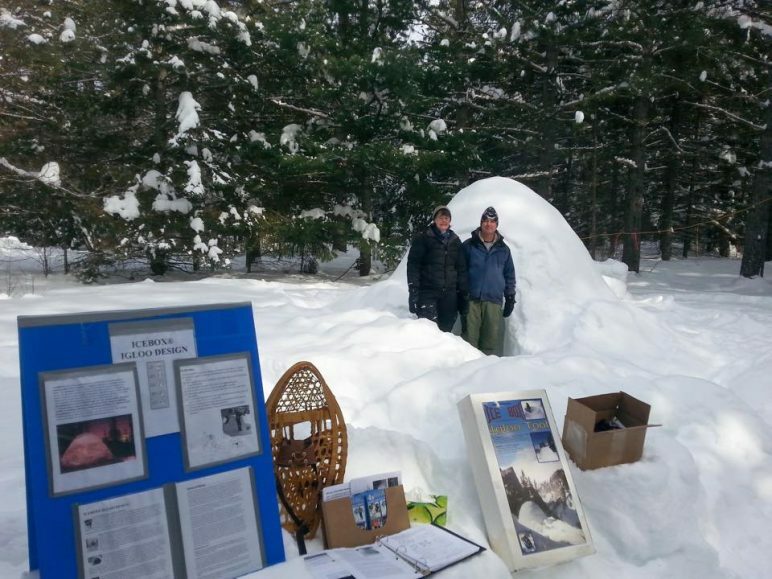 This family event celebrates Algonquin Park in winter. “Get Outside. Go Explore. Do Stuff!” Gayle is an outdoor/lifestyle blogger who wants to inspire people to get outside, go explore and do stuff. She’s a hiker, camper, paddler, snowshoer and geocacher who loves to get outside with her daughter and husband. 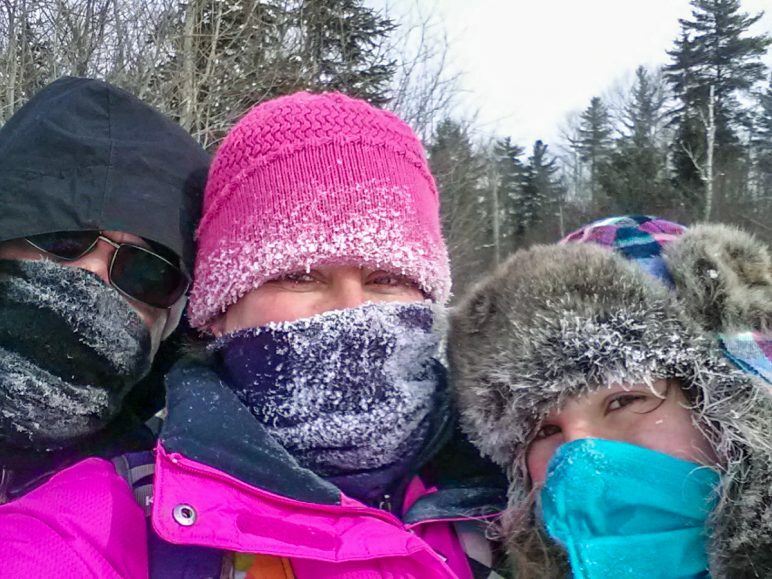 Gayle’s blog, Sometimes Eventful is all about her adventures with her family in Ontario’s outdoors. Gayle is also the host of the #WeGetOutside Twitter chat, which runs every Tuesday from September to May.